JEREMY Corbyn wound up the Labour Party conference in Liverpool on Wednesday with a powerful speech, calling for unity and for taking the fight to the Tories. He attacked the Tories, saying that people want change and that Theresa May’s premiership was the government of the privileged few. Corbyn spoke of the proposed constituency boundary review as “gerrymandering” — ostensibly to save money, yet David Cameron as he resigned added 260 new peers to the House of Lords at a cost of £34 million a year. A SERIOUS incident at Canning Town Tube station was made much worse than it should have been by a shortage of staff at the station, according to a report leaked to the press last week. The incident, where a woman fell between a train and the overcrowded platform, happened on 26th May this year and led to the Jubilee Line being temporarily closed. And the woman faced a long wait before being rescued, with her foot trapped between the train and the platform, because the control room at the station was unstaffed. ACCORDING to figures recently obtained from the Donetsk People’s Republic (DPR) authorities, since the February 2015 Minsk II agreement over 3,600 civilians have died in the republic because of shelling, sniper and other attacks by the Armed Forces of Ukraine. JEREMY Corbyn, as expected, won the contest for leadership of the Labour Party and with an increased majority from last year’s contest. It would have been a much bigger majority if the National Executive Committee (NEC) of the party had not spent the last few months furiously expelling and disallowing as many Corbyn supporters as they could from taking part in the ballot. 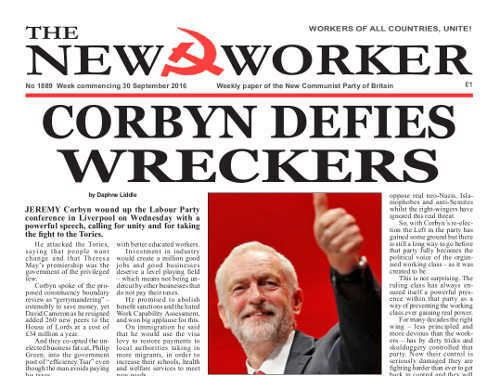 Earlier this summer elections to that NEC produced a majority in favour of Corbyn and this newly-elected committee was expected to take over at the Labour Party conference in Liverpool this week. Control of this committee is vital. The old committee had been shamelessly changing the rules at every turn to block Corbyn supporters and to undermine his leadership. And at the conference they had another trick up their sleeves. They regained control of the new NEC by changing the rules again to admit special places on the committee for a representative from Scotland and one from Wales. But these new places would not be filled by any democratic vote — they would be appointees nominated by the leaders of Labour in Scotland and Wales — both of whom oppose Corbyn. Following Corbyn’s second victory, some of the 170-odd Labour MPs who had tried to destroy his leadership in June with a mass resignation and vote of no-confidence said that they would now accept his leadership and some would return to their Shadow Cabinet positions. This underlines their remarkable arrogance in assuming that these positions are theirs for the asking, in spite of their disloyalty. Others have been keeping quiet.